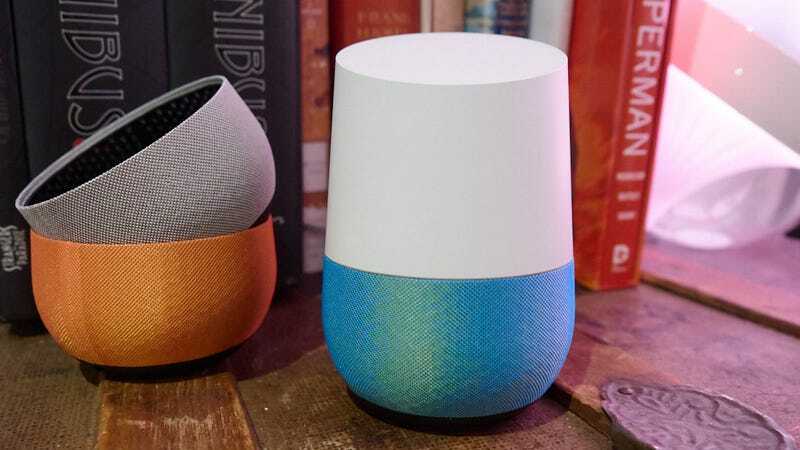 Google has been steadily improving its smart speaker with updates facilitating more fluid conversations, as well as the addition of routines for chaining together multiple tasks with a single command. Now Google is adding scheduling to the mix, which means your mornings can start just the way you want them, at the same time, every time—so long as you don’t mind sticking to a strict schedule. Google’s routines let you string multiple actions together using custom voice commands. That means asking Google to “set the table” can trigger a slew of actions, including dimming the lights, turning off your Chromecast stream, and playing some soothing music to masticate to. The new scheduling feature seems to be rolling out to Google Home devices now, letting you trigger those same routines at specific times. You can still use custom voice commands on those routines, but the addition of scheduling means every morning could greet you with the weather, your favorite playlist, and a blinding beam of light from your smart bulbs. Scheduling is a welcome addition, but the feature is rather rigid today. Why aren’t there also options for adjusting routines based on your local sunrise or sunset, or for scheduling routines to activate when you leave or arrive at predetermined locations? I, for one, would love it if my air conditioner kicked into gear 15 minutes before I arrived at home. Some Google Home owners still haven’t gotten their hands on the basic routines functionality Google released earlier this year, presumably a prerequisite for taking advantage of the new scheduling feature. Also, Google’s Assistant itself isn’t yet available globally. A Google spokesperson tells Gizmodo the scheduling feature should come to all Home devices in the U.S. over the next week. You can check if you’ve got the new feature yourself by opening the Google Home app on your smartphone. Hit the Menu icon, then hit More Settings, and scroll down to select Routines. You can hit the plus icon to create a new routine, where you’ll hopefully see the “Set a time and day” option.